Last fortnight I wrote about making space for emissions. Let's discuss how this can be done. Let's discuss this with governments meeting, possibly for the millionth time, to discuss the global agreement to combat climate change. Let's discuss this when we know with some greater certainty that global warming is beginning to adversely change our world. And we know that in spite of all the years of intense negotiations, governments have done too little to avert the reality of climate change. Let's discuss this during a fortnight when a study commissioned by the British government has concluded that evidence not only shows that climate change will be disastrous for countries, particularly the poor, but also that it would cost the world much less if it invested today in mitigating emissions. The uk report authored by economist Nicholas Stern is important for this reason. It is an economist's warning in a world run by them. I say this because for far too long these smart people have argued that climate change is too uncertain and, therefore, there is no reason to take high-cost action today. It is better to wait and see, if necessary adapt. It has also been assumed that in this scenario, as climate change happens in the far future, technological innovation and transition will also happen. The market will happily provide answers. But most of all, this breed has lulled us into complacency. There will be no costs to the transition towards an economy which is able to delink economic growth with the growth of its emissions, they have said. Secondly, the issue is about sharing that growth between nations and between people. The fact is that global economic wealth is highly skewed. Put in climate terms, this means that global emissions are also highly skewed. The question now is whether the world will share the right to emit (or pollute) or will it freeze inequities. The question is if the rich world, which has accumulated a huge 'natural debt' overdrawing on its share of the global commons, will repay it so that the poorer world can grow, using the same ecological space? 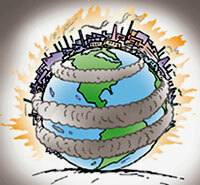 The way forward would be to re-negotiate the world's agreement on combating climate change. But this time the agreement must be political. It must reflect the desperate urgency of the world. It must be fair and meaningful. In other words, it must not take the world another 15 years to cut emissions and get something as weak and pusillanimous as the current Kyoto Protocol. The answer lies in the way we have framed the questions. It has been lost in the obduracy of the us government, which has never accepted the need to build a fair and cooperative agreement to combat climate change. The us, still the world's single largest contributor to climate change and whose emissions continue to grow, says it will not join an agreement which does not involve India and China. The result has been a weak and compromised agreement called Kyoto, which allows renegade polluters -- the us and Australia to opt out.